It is very seldom that a woman in apron would come to your table to teach you how you should eat your food. Well, maybe at home, but we are talking about a Korean restaurant here. 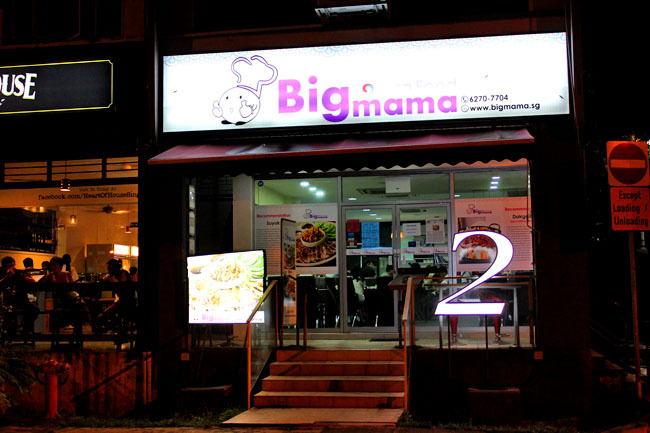 Big Mama Korean Restaurant is not exactly ‘Gangnam Style’ (I know the song is hot, and it is Korean language colloquialism that actually refers to a luxurious lifestyle), but offers comfort ‘Home Style’ cooking. 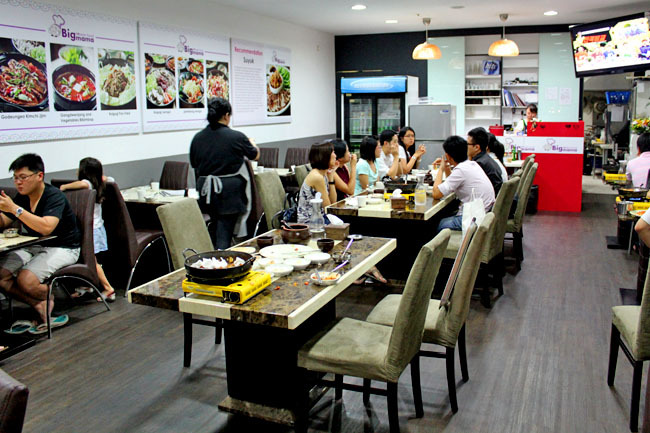 Former tutor and caretaker, Ji-young Nam Gung nick-named as “Big Mama” (looks like “Cooking Mama” in the Nintendo game), has set up a homely Korean eatery at Tiong Bahru after cooking for Korean students in Singapore for years. Her Korean dishes are in between authentic and creative, because half are inspired by her own mama’s recipes while others have been fine tuned to suit Singaporean taste-buds. It was quite funny because my friends were all trying to guess who Big Mama was, then realised it was not difficult to point out. The one behind the cashier loh. The restaurant looks quite minimal in terms of decor, but has groups of Koreans dining, an indication that this is worth your try. There are two big pictures of the Dakgalbi (spicy grilled chicken) and Suyuk (steam pork belly) on the wall, which suggests that these are the two must-try dishes. 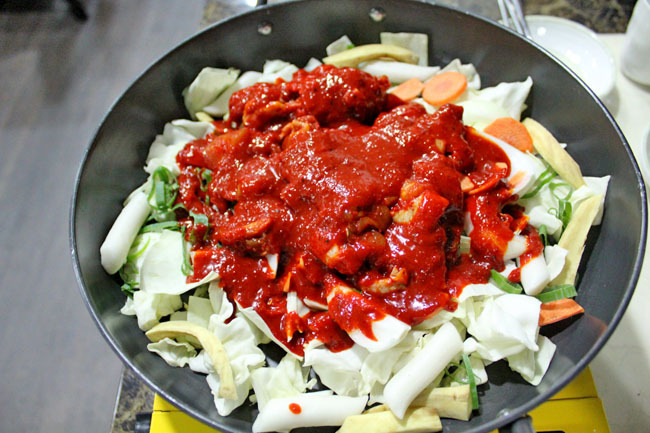 Big Mama or one of her staff would help you prepare the Dakgalbi ($15 per pax, min 2 pax), where marinated chicken chunks, Korean rice cake and vegetables are fried with a special homemade chilli sauce right in front of you on a grill. Surprisingly, this is very delicious with the saucy chicken going extremely well with plain rice. Maybe it is also Big Mama is talking while preparing, which makes us feel right at home. Yes, she would tell us how to eat Korean food the right way. 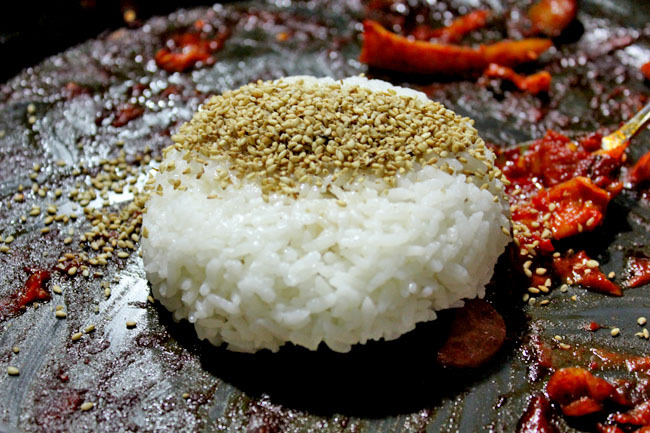 A tip is to NOT finish the ingredients, because Big Mama would fry it with rice (additional $3.00) if requested. 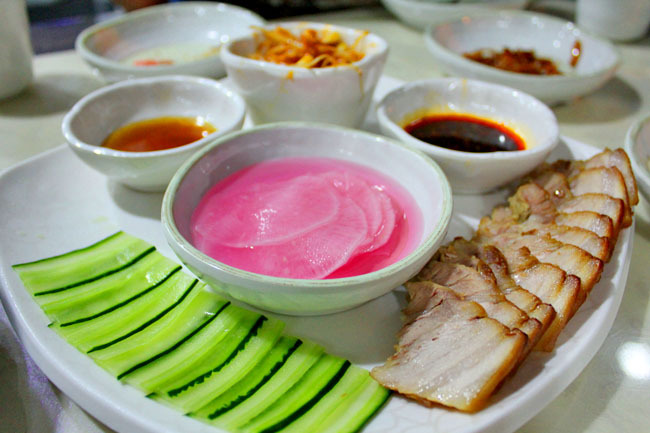 Normal Suyuk are thinly-sliced boiled beef or pork served with a soy sauce or a salted shrimp dip. Big Mama’s Suyuk ($25/$40) uses a special steaming method for the pork belly, ensuring the outside stays crispy while the inside is tender. She also removes all the extra fat so that it is healthier. The pork is eaten wrapped within delicate celery and cucumber slices, then dipped in either a saltier black bean sauce or a sweet spicy sauce. Does it already sound good? Big Mama may not be the most polished chef, but she prepares home-style Korean food with a big heart and bigger smile, making this one of the best Korean restaurants I tried locally. Kamsahamnida Big Mama! gentrification of the area has not necessarily brought about social “conscience”. Patrons of the eateries sometimes make loud and unbecoming conversations that ring through the old blocks. Smokers take their puffs in alleyways, leaving cigarette buds on the floor. I know it is not the job of one food blogger to mind things other than glorious food, it would be an extra edge and angle to write and remind fans and friends the social etiquette that comes with off-the-beaten-track dining; the plain good ol’ manners of respecting the many who have lived there many years. Hi Le Peng, great to hear from you. I did notice the very expensive cars along the stretch at Yong Siak, very different from the good old days. Good point you raised, There are just so many aspects of food we can talk about – but it’s true, I don’t think many of the Tiong Bahru residents are too happy about how their estate has changed. I hadn’t realize you were the originator of the White affair. Ah, now, your advice and pointers on social etiquette and being neighbourly especially when patronizing eateries in residential areas will hold much weight. I live and grew up in Tiong Bahru. We welcome an infusion of life into old estates, but people must also take care of the environment and maintain the very qualities that made them endearing in the first place. oooh I love the food at BIG MAMA. Being a resident at Tiong Bahru, its nice to have all these new F&B outlets breathing new life into a once sleepy neighbourhood, but I do miss the old TB whereby there are more old quaint provision shops. Mosf are gone to make way for these new F&B outlets. Sadly, not all F&B outlets can make the cut since most are only jumping onto the bandwagon to ride on the hype surrounding TB estate. Do you mean PS Cafe? Actually, I could imagine if I am a resident of TB, I would be frustrated and disappointed to see all my familiar hang-out places get replaced by these ‘hippie’ shops. Really ah? Why bad? Care to elaborate? Any recommendations on where to park? There is a multi-storey nearby, about a 5 min walk.